Over the last few years I've really grown to love having books in my home. When we first started off being parents we had zero children's books, and now they're something that I love, and even collect. It kind of counter acts the whole minimalist lifestyle that we're striving for, but nothing makes me more happy than having a massive bookshelf filled with books. I think reading is so important and It's something I really hope my children will love as they get older. My three-year-old loves books. Each day before nap and bedtime we read stories for about 30-40 minutes or until he falls asleep. 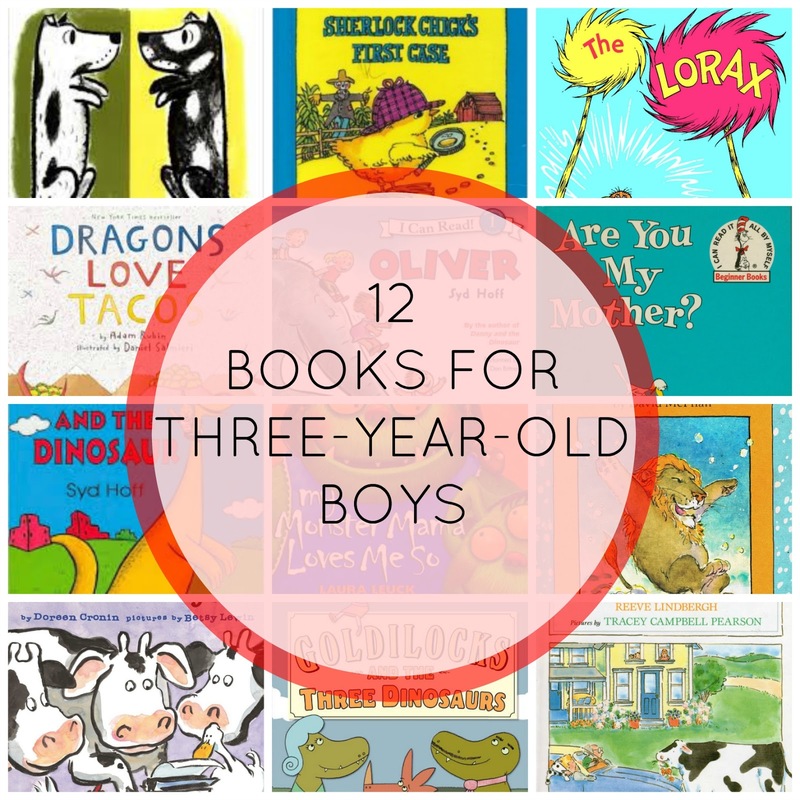 While the books we read usually get rotated through every so often, these 12 are ones that he really loves right now, and I think your little boy, (or girl!) would get great enjoyment out of them too! Harry The Dirty Dog: A fun story about a dog who hates taking a bath. Go one a journey with him as he spends the day getting dirty! Sherlock Chick's First Case: This was one that I loved as a kid and my mom sent it to Jay for his birthday this year. You can't buy it online anymore, but check for it at your local library if you have a budding detective, or chick lover in your house. The Lorax: One of my best friends gave this book to Jay for his second birthday and we have read it three times a day (at least), everyday for over a year now. Which means I've read it over a thousand times. If your into long Dr Suess reads, this one is great! Dragons Love Tacos: This story about dragons is super cute, and witty. My little guy laughs every time we read it! Oliver: This was gifted to us last Christmas and it's been a bedtime favorite ever since. Follow the journey of an Elephant who gets kicked out of the circus and spends his day trying to be like other animals. Are You My Mother: Derek gifted this one to me on my first Mother's Day. Jay actually didn't like reading it for about two years and now its one that he wants read daily. Danny And The Dinosaur: Another Syd Hoff book that we love. Follow Danny along for the day as he gets to play with a dinosaur who has escaped from the museum! My Monster Momma Loves Me So: We snagged this book from some friends in North Carolina and it is one of my favorites. It's all about the mommy life of monsters and is super cute. Jay can't help but laugh every time we get to the last page (mainly because I tickle him). Click Clack Moo, Cows That Type: We took this story out from the Library when we lived in NC and renewed it about 6 times. When we decided to just buy Jay books for his birthday this year, we knew this one needed to be on the list. Goldilocks And The Three Dinosaurs: A super fun retelling of the original Goldilocks story. Definitely makes it more entertaining for little boys... and visitors from Norway. There's A Cow In The Road: Another book sent from my mom. She told me this was one of my favorites when I was little, and it's definitely turning into one of my favorites all over again. It's a fun story about a little girl getting ready for school who gets greeted by a cow! So cute--what a sweet idea! I have a nephew who will be three next year so this is helpful :) When I threw my sister her baby shower, we did a 'book instead of a card', which started off his little library. Great share! This is so helpful. We go to story time and I always need help for what to check out. I have no kids yet I have read/heard every one of these books. lol. My mom worked in a day care center for 20 years (she was the director of it), and she also teaches child development and children's literature at the high school, and she teaches Love & Logic to adults, so I've grown up listening to her read and talk about so many little kids books. She even has some of the books memorized because she reads them so much. lol.